We are anchored in a familiar spot, right off the beach at Bimini Sands on South Bimini Island, Bahamas (map). We spent several days anchored here, across a couple of different weeks, on our last visit to the islands, and this is where we responded to a Mayday call for a sinking center console at the beach. I am online this evening courtesy of my T-Mobile cell phone, which does have fairly good high speed coverage here. I am sure it works in Nassau, too, but I am not holding too much hope for the other islands. We'll be out of coverage entirely for the next two days, so I wanted to get a quick update in tonight. 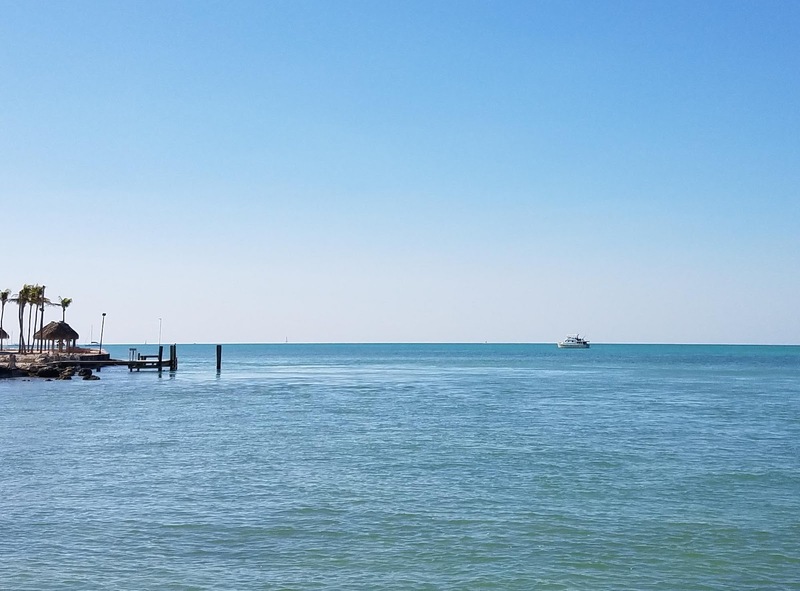 I'll start by saying that the last update was written as we were underway in the Hawk Channel between Key West and Marathon. I was so focused on getting all the important details in the post that I never actually mentioned we were under way. We arrived in Marathon just past cocktail hour, setting the hook in our usual spot just off the Sunset Grill (map). We opted to keep the tender on deck and eat aboard, enjoying the sunset from our own aft deck. Instead, we splashed the tender Friday morning and went ashore for brunch. It took quite some time to get the tender started, after sitting on deck and quite a bit of rain-induced bilge pump operation, so it was just as well that I didn't start that effort after a long day under way. Vector in the distance, from Sunset Grill. After brunch we rode into Boot Key Harbor just to see how things were coming along after the hurricane. There are still a few wrecks in the harbor, and many more boats afloat and back on their moorings but with substantial exterior damage in evidence. Most everything else appears back to normal and the marinas are full. We passed the slip at Burdines where our friends' boat rode out the storm and survived almost unscathed, and marveled again at how fortunate they were. Burdines itself looks unchanged, even though I know they had to rebuild a bunch of stuff. After our impromptu tour we returned to Vector and moved a few hundred yards south (map) to get out of a nasty swell. I spent the rest of the afternoon sucking down as much Internet as I could while we were still in coverage, using the bandwidth to update all the charts and cruising guides and updating the software on a pair of old Android phones "just in case." 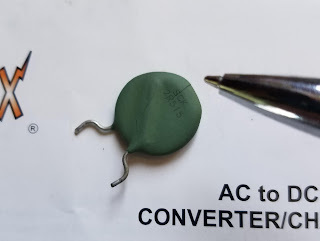 I also made one last attempt to repair the auxiliary battery charger with some guidance from the manufacturer. Alas, it appears they will need to send me a new thermistor to finish the job, and that will have to wait now until we return to the US. Blown thermistor; note crack. It kept melting the solder pads and coming out of the board. Somewhere during all of this, a small boat apparently allided with the Old 7-Mile Bridge right in front of us and flipped over, sending its occupants into the water. We neither saw nor heard it, but we heard about it on the marine radio and we spent a bit of time in the pilothouse watching the rescue through binoculars. If we had simply stayed where we had been in the morning we would have had front-row seats. It would appear the occupants were not seriously injured, but the boat was a total loss and we watched SeaTow haul it off, still upside down, just before we left. Our projected time to Bimini was 16-19 hours depending on Gulf Stream current, and so we held off weighing anchor until 6pm. That would give us an earliest arrival of 10am, which would give me enough time to get some shuteye and still be back at the helm well in time for the approach. We had dinner under way shortly after weighing anchor, and by the time we were done eating we were outside the 3nm limit and could take care of that bit of business as well. I started the watermaker after we finished macerating, and ran it for seven hours. Disappointingly, production started out at just 10gph even though it did 13 in testing, and it steadily dropped throughout the run, finishing at about 7.7gph. Still, that put another 50 gallons in the tank, topping it off. Even at 8gph we should be able to keep up with our usage just by running it under way. The ride was rougher than anticipated, with short-period swells on the nose that had the boat pitching most of the night; not overly uncomfortable but challenging to move around the boat. Still, I had a relaxed watch, passing two freighters in the other direction and being overtaken by three cruise ships making their way back to Miami or Fort Lauderdale. Cruise ships are discernible by their glow even while still beyond the horizon; from just a couple miles away they are blindingly bright. By contrast, freighters are darker than the surroundings, silhouettes against the faint glow of distant cities. On a moonless night it is imperative to go out on deck periodically to scan the horizon, and I was often circling the deck from one pilothouse door to the other. At one point I got up to check on the cruise ship just a mile off our starboard and latch the port door that was bouncing open from the last circle. The boat hit a wave and took a sharp roll to starboard before the stabilizers corrected it, and I watched from across the room as my laptop fell backwards off the chart table and dropped ten feet to the bottom of the companionway. The power cord barely slowed it down, and it landed on the very bottom step and exploded into pieces, waking Louise in the process. After double-checking on the cruise ship I made my way down the ladder. To borrow a phrase, numerous fragments, some large, some small. It was still running, though, and I could read the display which had completely separated from its case. I was able to shut it down gracefully but there was nothing else to do for it under way, so I piled all the parts in a heap on my salon chair. I had been catching up on social media when it went over, with the very last of the AT&T signal as we angled slowly away from the Florida coast. I was hoping to post a quick update here as well as get a couple of emails out, but I was unprepared to do either of those from the tiny screen of my phone in a moving boat. I was at least able to check the weather a final time and read the news before the Internet flickered out. Louise came on watch early, at 2:30, and I fell right to sleep. It was short-lived, as Louise had to wake me several times. In the heaviest part of the stream, the current was moving us sideways so fast that the autopilot could not keep up. I think it has a maximum rate of turn that it will allow to get back on track, and if it can't, the cross-track error just continues to grow. I had to hand steer for a while and our track made us look like drunken sailors. With no fixed references we were unsure if the compass was working properly. I ended up using the stars to verify the compass was, indeed, correct, and that we were headed due east, or a heading of about 90°, to make way on a course of 55°, which is mostly northeast. Crabbing sideways by 35° or so appears beyond the capability of our ancient autopilot, but we were able to get back on course using heading-only mode. All that extra push had us here at the early end of our window, just after 10am. After getting the hook down and the boat secured, I splashed the tender and headed ashore to clear us in. Customs is located at the Bimini Big Game Club, and the dockmaster let me tie up while I cleared in. I first had to walk down the street to Immigration, where I squeaked in just before the officer had to leave to meet the ferry. Customs rubber-stamped my five pages of paperwork, took my three C-notes, and handed me our cruising permit in the span of less than five minutes. Before heading back to the dinghy I asked the dockmaster if anyone sold SIM cards nearby and he sent me across the street to the store. I paid a $5 premium over what the phone company charges, but I got a card right away and loaded it with 15gb of data so we are good to go. Well, sort of. Remember those old Android phones? One is my most recent Galaxy S5 which I asked Sprint to unlock for international use just before I turned off my service. I got an email saying it had been unlocked, but when I put the BaTelCo SIM in it, no dice. I spent probably two hours today fiddling with it, but it looks like I am going to have to call Sprint and/or possibly have it back on service in the US to get the unlock completed. Anticipating that SIM unlocking might be a problem, I also brought along an even older phone, the Galaxy S4 that I used on Sprint up until two years ago. That phone is also unlocked, but, more importantly, I had used it here in the Bahamas on our last trip so I knew it would work. And work it does, but... The reason I upgraded from this phone two years ago is that the charging port had become intermittent and the phone itself would reboot randomly. So, we have Internet, but it will be a challenge to keep this old phone running for the entire trip. 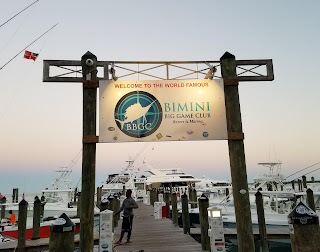 Bimini is not nearly as full-up with tourists as I had anticipated, and the whole process ashore took less than an hour, between Immigration, Customs, and the phone card. When I got back to Vector I began to deal with my computer crash, in the literal sense of the phrase. Louise was cashed out below decks. While both the upper and lower halves of the case were damaged beyond repair, all the innards were still working. I had an entire carcass in my spare parts bin, from the last time something broke, and I was able to swap my motherboard, disk, and keyboard into that case, which still had an intact screen. I lost my touch-screen display in the process, but I seldom used that feature anyway. I am happy to report that my computer is back intact and running and enabling this post. I'm very glad, because you may recall I have just spent some dozens of hours getting licensed charts loaded and working on it, and getting the licenses transferred to a different machine is difficult if not impossible. Also, I had a number of routes entered but not yet transferred to the helm. Big Game Club after the sport fishers return for the evening. We returned to the Big Game Club together in the evening for a nice dinner on the deck. The deck affords a great view of the marina docks, filled as they are with a lot of self-important Miami skippers out for the weekend. We had a very brief stroll around Alicetown after dinner before heading home. One day is plenty in Bimini, especially with all the time we've spent here before, and if we're not out of here by Tuesday there will be no place to hide from the incoming weather. Accordingly, we will weigh anchor in the morning for the two-day run across the Bank to the Berries. That will be new ground for us, and Monday evening we should be anchored somewhere near Petit Cay. I don't know if we will have cell signal there or not, but certainly we will have not until then. If I can't get online, I will post our updates via sat phone on our Twitter feed, here. I always look forward to your posts. Haven't commented since I saw Osyssey expertly parked in the Ventura West Marina years ago when you began your trawler search. We discussed the Defever 53POC (my current boat). I just wanted you to know that i learned a new word today: "allision". Thought you may have made a typo but that would be out of character, so i looked it up! I look forward to many more post. Safe travels to you both!